Dr. Pam Moran served as the Superintendent of Albemarle County Public Schools in Virginia from January 2006 through June of 2018. She now serves as the Executive Director at the Virginia School Consortium for Learning. 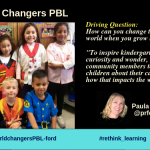 Pam has a clear vision of what educational experiences should be for students in today’s world and embodies the paradigm shift that must be made to make schools relevant. Pam Moran is a leading advocate of an educational model that prepares all students for success. 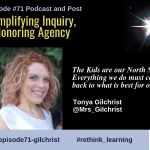 She emphasizes the value of student-led research, project-based learning and contemporary flexible learning spaces that promote collaboration, creativity, analytical problem-solving, critical thinking, and communications competencies among all students. I grew up in a family of makers. My husband, John, is a maker and artist extraordinaire.. 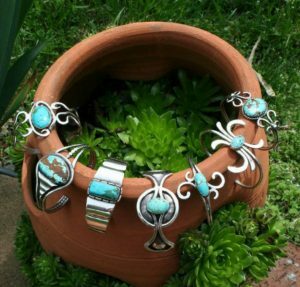 He went to the University of New Mexico but then started making jewelry and working with silver. Included a picture of some of his beautiful jewelry to the right. John built our timber frame house we live in and he’s a wonderful dad. Despite the fact that he is wheelchair bound, he is still someone who is active and interested in so much. Every day, my son, Jason, who is a digital media director in New York City, calls his father and they have wonderful conversations. Life is such a great place. If we see ourselves as open to learning, we can continue to evolve and develop who we are and what we can bring to this planet. If we define ourselves as educators, we’re constantly focused on seeing learning as a lifetime event not just something that happens when you got to school. I have a mother who is 97 years old. 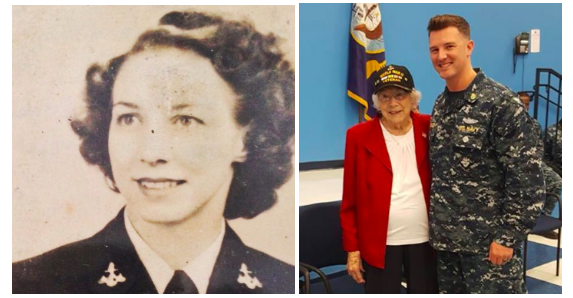 She was actually a World War II Vet who worked for naval intelligence in Bainbridge, Washington which is an island outside of Seattle. She worked on breaking Japanese code during WWII. She just received a Congressional award for her work. Two pictures of my mom at 23 and 97. One of the interesting things is that there was secrecy about her work. She was not allowed to share that she received this medal from the Secretary of the Navy at that time. In 1996, she told our family during the holidays that she had something to share. She pulled out a box with a letter that she had just gotten something that was declassified. That meant she could tell her family what she actually did in the war. She had kept that secret for a lifetime. We never had a clue what she did in the Navy. What this taught me is that my mom was always a person who lived her life by doing what she says and saying what she’s going to do. I am so grateful that I’m still able to have amazing conversations with her. She has been a great model for me to really think about what it means to just stay open and interested in everything that is going on in life. She’s still that way at 97, and she has amazing stories. We can learn from anyone if we continue to remember that the lessons of life really are timeless. Even when you do have conflict in the work that you do, that if you come from a position of honesty, integrity, and trust, what a difference it makes in terms of the relationships you have. I had a different trajectory as a student. I grew up on a farm in the low country in South Carolina. We grew up when segregation du jour was the law by redistricting of schools. It was a different experience. When you live in a place like I did, you grow up in a very diverse community. Our African-American community was a strong community and one that was very present and a lot of interaction with the Caucasian community. If you were white, as I look back, the privileges you have are very apparent. 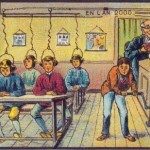 If you were very thoughtful about growing up in a very segregated school system. The fact is that in rural South Carolina when I went through school, it was very limiting and no one had the breadth and depth of education we have today. We had some good teachers, but I had a lot of teachers who had not finished four year colleges but went to “normal” schools to become teachers. 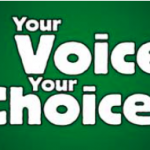 (2) Have you ever thought of being a teacher? So I went off to college to a small liberal arts college, Furman university, in a program that was pulled together around field biology doing a lot of work in the outdoors. I enjoyed the work of field biology, but I ended up teaching in Virginia and doing a Masters and Doctorate at the University of Virginia. My career in public education began as a high school science teacher. I subsequently served as a central office science coordinator and staff developer, elementary school principal, director of instruction, assistant superintendent for instruction, and adjunct instructor in educational leadership for the University of Virginia’s Curry School and the School of Continuing Education. She holds a B.S. in Biology from Furman University and Master’s and Doctoral degrees from the University of Virginia. I am also an alumnus of the University of Virginia’s Darden School of Business Executive Educators Leadership Institute. I am a past President of the Virginia Association of School Superintendents, Women Educational Leaders of Virginia and the Virginia Association of Science Supervisors. I’ve held leadership positions with the regional Chamber of Commerce, the Charlottesville-Albemarle Public Education Fund, and the University of Virginia-Public Schools Educational Partnership. I served as the Superintendent of Albemarle County Public Schools since January 2006 until June 2017. The division includes more than 1,200 teachers educating 13,700 students in 25 schools. During mys tenure, Albemarle County Public Schools has become one of the top performing school divisions for students in the state with an on-time graduation rate of 95 percent. Two out of every three high school seniors graduate with an Advanced Studies Diploma, 30 percent higher than the state average for all school divisions. Best way for me to share what happened in Albemarle County Public Schools is to show you. Edutopia collection of shared articles about the students and schools. Albemarle County Public Schools is comprised of 26 schools in Albemarle County, Virginia. 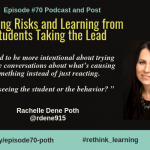 A blend of primarily rural but also suburban and urban schools, each one embodies the culture of innovation and risk-taking that is the core of the district’s approach to teaching and learning. 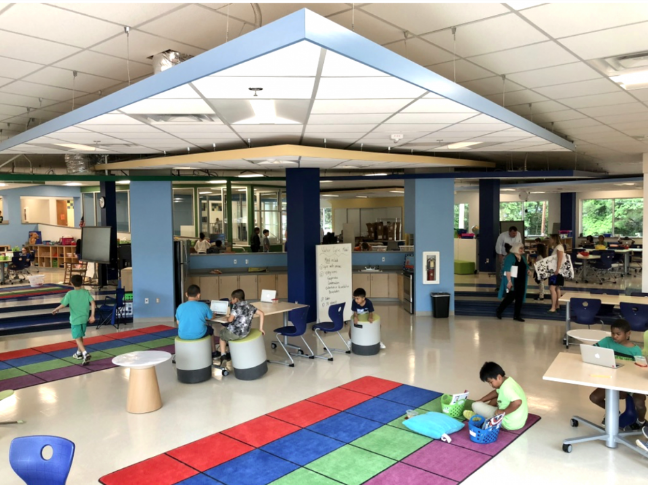 From makerspaces and curriculum to the use of social media, flexible classrooms, and instructional coaches, Albemarle gives students the life-long learning skills they’ll require to succeed. In 2017, a national survey organization ranked Albemarle County Public Schools in the top three of all school divisions in Virginia and among the top two percent of all school divisions in the county. Among the school division’s flagship programs are its Learning Commons, AVID (Advancement via Individual Determination) and M-Cubed. Both the Learning Commons and M-Cubed have received the National School Board Association’s Magna Award, given annually to the school division in the nation with the most innovative and effective program. The school division is the only one in the history of the Magna Award to twice receive the association’s highest performance honor. The school’s Learning Commons, which is a multi-disciplined, technology-infused learning center, has attracted visits by MIT, Harvard, the Universities of Virginia and North Carolina and from the Smithsonian Museum and the New York Hall of Science. M-Cubed is a program that supports black middle school males in year-round advanced math studies to improve their high school academic performance. The division’s Jack Jouett Middle School is in the top three percent of all schools in the world for the success of its AVID college and career readiness program. Writing was a labor of life. After single year of my 43 years of my career, one thing is that if you are open to learning, that every single year of your life can be filled with amazing new opportunities to learn and develop and be a part of a community that makes things better for kids. 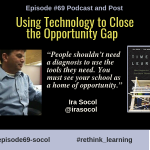 I was fortunate to co-author this book with Chief Technology Officer Ira Socol and Lab Schools Principal Chad Ratliff to demonstrate how you can implement innovative practices that have shown remarkable success. We use progressive design principles to inform pathways to disrupt traditions of education today and show you how to make innovations real that will have a timeless and meaningful impact on students, keeping alive the natural curiosity and passion for learning with which children enter school. Using examples from our own district as well as others around the country, we created a map of the processes necessary to move from schools in which content-driven, adult-determined teaching has been the traditional norm to new learning spaces and communities in which context-driven, child-determined learning is the progressive norm. This is Barbara. I shared a few of the excerpts from our conversation and hope you listen to the entire podcast with Pam. I learned so much from her about Albemarle County Public Schools, their book, and her new journey with Socol Moran Partners LLC with Ira Socol. 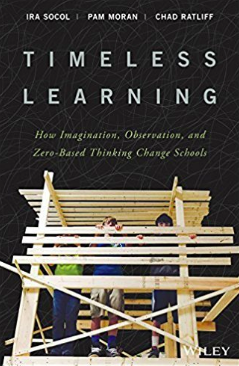 I highly recommend that you read Timeless Learning or contact Pam for any school or district interested in transforming teaching and learning. Thank you, Pam for sharing your story! A past gubernatorial appointee to the State Council on Higher Education for Virginia, Dr. Moran was selected by her peers across the Commonwealth as Virginia’s 2016 Superintendent of the Year. She subsequently was one of four statewide superintendents of the year to be selected as a finalist for 2016 National Superintendent of the Year. In 2016, Dr. Moran was selected to serve on the Aspen Institute’s National Commission on Social, Emotional and Academic Development. 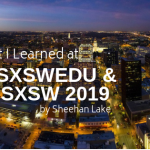 She is a member of the MakerEdorg advisory committee and has delivered several TED Talks on the impact of creating a contemporary learning environment for students, one shaped around a student-centered project-based instructional model. Under her guidance, Albemarle County Public Schools was selected in 2015 for membership in the League of Innovative Schools., a nonprofit organization authorized by the U.S. Congress to accelerate innovation in education. Dr. Moran has appeared on the cover of Education Week’s Digital Directions magazine as a “National Mover and Shaker” for her advocacy of a curricular digital integration model, which will be featured in an upcoming profile by Edutopia. She also was selected by eSchool Media as one of its national Tech-Savvy Superintendents of the Year and under her leadership, the school division received the Virginia Governor’s Tech Innovation Award. Dr. Pamela R. Moran has been named the new Executive Director of the Virginia School Consortium for Learning (VaSCL). A statewide education organization headquartered in Palmyra, VaSCL includes a membership of more than 70 school divisions across the state. Its mission is to improve the quality of K-12 education in the state by providing high-quality professional learning to educators and by facilitating the sharing of best practices among school divisions.